The classic red barns with white trim and long lane way lined with a canopy of mature trees are some of the many charms of Wyoming Hereford Ranch. Cattle breeding started here in 1883 and this is a big part of the history of the ranch and the area. 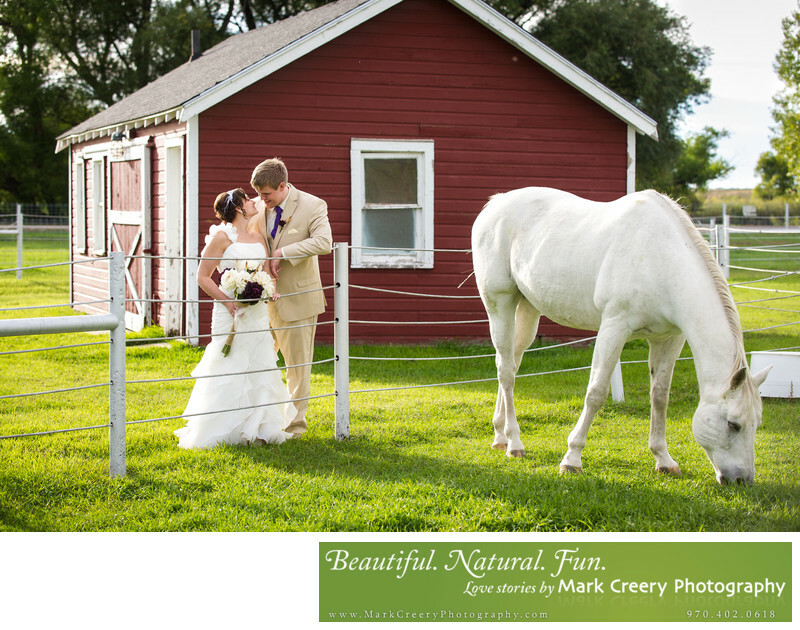 They have a pretty outdoor ceremony location close to Crow Creek and next to willow trees and barns. There a couple of of indoor reception spaces as well - one in the loft of the Horse Barn (for groups of a 100 people or less), and the Sale Barn for large receptions. The couple can even ride a wagon into their reception and make a grand entrance! In this photo, we found a cute little barn to take portraits in front of. We got lucky when a beautiful white horse wandered over to check them out. The horse is casually going about his business while the couple share a semi-private moment between them. If you're looking for a wedding photographer in the Cheyenne area, I am just a short drive from town so I love to get across the border and photograph weddings here.